1 Duck $5, 2 Ducks $10, A flock of five are $20. A large flock of 13 Ducks are $50. The Amazing Duck Race was founded in 2008 as one of Civic Days largest Fundraisers. 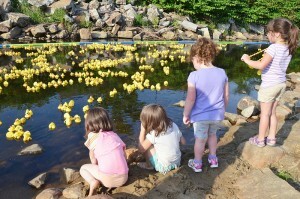 The event features the adoption of rubber ducks that annually flock down the Nashua River on the last Sunday of June. Help support Civic Days and adopt your ducks today! 1st Prize is $1,000, 2nd Prize is $500, 3rd Prize is $250. More prizes to be announced throughout the year! Adopt your duck today! Download out 2016 Duck Race Form!